GE will spin off its GE Healthcare into a standalone business as the struggling behemoth that yearns to be a “simpler, stronger GE” focuses on its aviation, power, and generator businesses. 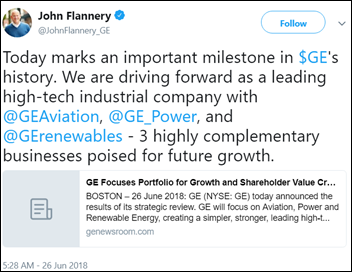 GE Healthcare President and CEO Kieran Murphy will continue his role with the standalone company, which brought $19 billion in 2017 revenue before its jubilant unlocking. From Sullen VIsage: “Re: Athenahealth. This poll says they should not sell out to Elliott Management.” I wouldn’t assign much value to an online poll whose results are headlined without indicating how many people voted (that site’s past polls have had a pitiful turnout), but there’s also the bias of customers and employees to resist change. Publicly traded companies, however, have just one customer – their investors — and the company is obligated to take whatever course of action that maximally enrichens them. The real question is whether that enrichment might be woefully short term versus the longer-term value that could be wrung out by keeping customers happy, improving efficiency, and allow their strategies the time to mature. However, corporate raiders are more interested in yard saling the assets and moving on to the next company rather than building value, while investors aren’t opposed of the idea of banking a quick profit by selling off the body parts. From Pomposity: “Re: CareSync. Clueless management strikes again and leaves employees hanging.” Maybe, but we don’t know why the company suddenly closed its doors. The timing suggests a due diligence issue that was performed late in the process, plus we already know from the “ran out of time” comments that the company was desperate to mate with a sugar daddy. You have to stop the bleeding at some point. It is hard to fathom, however, how a company could raise nearly $50 million, hire a ton of people and move them into a swanky headquarters, operate in what seems like a promising business sector, and then blow up whatever asset value and goodwill remained by just turning off the lights for good. I can only speculate that despite the investment interest, the company was burdened with so much debt that even bankruptcy couldn’t have saved it. It’s also hard to fathom why CareSync needed 300 employees to run what seems like a simple, modestly promising business, but I can’t second guess the folks in charge since their money was on the line and mine wasn’t. Clinical interoperability network vendor Health Gorilla raises $8.2 million in a Series A funding round. Outcome Health co-founders Rishi Shah and Shradha Agarwal – who had already resigned their top executive positions in a settlement with investors who claimed the company had defrauded them – leave their board positions as the company tries to regain credibility and its pre-scandal $5 billion valuation. AllianceRx Walgreens Prime — the specialty pharmacy formed by Walgreens and pharmacy benefits manager Prime Therapeutics – chooses Inovalon’s specialty pharmacy system. Amita Health selects R1 RCM for revenue cycle management services. Memorial Healthcare (MI) selects Parallon Technology Solutions to lead its conversion from Meditech’s Magic to Expanse. West Virginia’s pharmacy board will use Appriss Health’s PMP Gateway to give all state prescribers and pharmacists workflow access to the company’s NarxCare system for detection of opioid misuse. Microsoft Healthcare hires Jim Weinstein, DO, MS (Dartmouth-Hitchcock) as head of innovation and health equity and Joshua Mandel, MD (Verily) as chief architect. Change Healthcare releases Assurance Attach Assist, which reduces provider claims rejection by recognizing the documentation that payers require and providing an electronic platform for its submission and management. A GAO report finds that the VA was spending $1 billion per year maintaining VistA, but even as it plans that system’s replacement with Cerner, work remains to define exactly what VistA is – especially regarding its site-specific customization – and how Cerner can replace the nearly 50 percent of VistA applications that don’t have a Cerner counterpart. 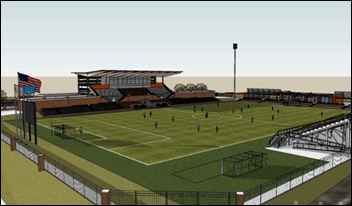 Oklahoma State University will name its nearly-completed, $20 million women’s soccer stadium after alumnus, major benefactor, and former Cerner Chairman and CEO Neal Patterson, who died a year ago. A Bloomberg analysis finds that government-encouraged employer experimentation with high-deductible health plans in the 1990s has made them nearly universal, with the result being that cash-strapped patients have simply stopped getting medical care instead of shopping for healthcare value as politicians had predicted. The plans have saved employers money, but in ways that seem to have harmed the long-term health of their employees in ways that may eventually become the problem of taxpayers who fund Medicare and Medicaid. A Comcast executive says, “Why did we design a health plan that has the ability to deliver a $1,000 surprise to employees? That’s kind of stupid.” He didn’t mention the people who buy their own insurance on the individual market who will be likely sucked in by the lower premiums of junk policies such as association health plans, whose nearly indecipherable terms exclude basically anything that requires a significant payment, such as those involving pre-existing conditions. As a restaurant guy told me once, you can buy hamburger meat at nearly any price you want to pay, but that doesn’t mean you would want to eat it. A TransUnion Healthcare study finds that an average hospital stay sticks the patient with a $781 bill after their insurance has paid, a 67 percent increase in the past five years. In Japan, two people with cancer die untreated after hospital radiology departments fail to share their diagnostic images with other departments within the same hospital , while several other patients required more complex surgeries due to treatment delays. An expert says information sharing has become more complicated as increasingly sophisticated medical equipment has increased data volume. HCTec will host the HIMSS Tennessee new member reception June 28 in Brentwood. Hyland completes a 70,000 square-foot expansion at its headquarters in Westlake, OH. Hyland releases Version 18 of OnBase. Summit Healthcare announces that several customers have upgraded from its Express Connect to Summit Exchange Platform. GE Healthcare Spin-Off: don’t expect any major changes for GE’s Healthcare business and strategy in the short-term; the unit was pretty self sufficient in terms of business operations and has had a fairly major cull, “trimming the fat” already. The bigger issue might be the split of cross-division research and development initiatives (big data analytics, IoT), harming competitiveness in the mid term. It may also force GE Healthcare to be more open-source in its approach moving forward, a major turnaround from its proprietary past in clinical IT. Ultimately could be a good move. Is anyone else alarmed that only 50% of the VistA applications will be replaced by Cerner? What “modernization” and “standardization” effort is that going to take so that there aren’t 20 versions of the same points of integration? It is a complex socio-technical environment. This needs to be done well for those who have served the United States of America. Alarmed, disgusted, offended … yes … but not at all surprised. THIS IS THE CERNER WAY. Zane Burke actually had the gall to say it out loud (below) in reference to the DoD contract. Exact same vaporware strategy works for the VA.
“There are other pieces of business in the DoD,” Burke said. “The more they go through and understand the capabilities, the more they say, ‘This wasn’t in our initial scope, but now that we understand it,’” the Pentagon is expanding the scope of Cerner’s work. “I think you can expect more of those kinds of things within the DoD. Even the core rollout to the theater was not bid as part of the original contract,” Burke said, referring to EHR installations outside the U.S. and aboard aircraft carriers. I think you’ve got your answer right there. Each million only pays for 6-8 fully-loaded employees (fully-loaded refers to the cost of paying for that employee’s salary, benefits, office space, computer, and so on). So $50mil covers around 300-400 employees for one year. Not really all that much for a company with nearly 300 employees, when you think about it. Revenues are where it’s at, not funding. The AHA needs to get their head out of the sand. If you take what they are saying at face value, they believe there have been no meaningful interoperability advancements in the last 15 years. Shortsighted. Dumb.